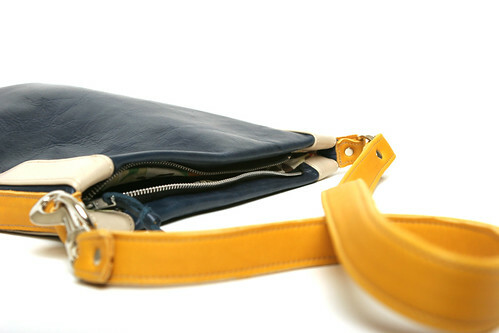 Now available on a browser near you – MariLassa.com – Anne Scott’s website for her one-of-a-kind handmade leather handbags. After our initial meetings and planning, one of the first tasks on the list was to assemble a library of her current product line, so a date was set and I cruised out to the studio with my gear and started shooting handbags. Then it was design time while adHOC collaborated with Anne to get the copy just right. Next it was development and thanks to the help of Joshua Clanton, the website was coded just right. It’s complete. With the set-up of several other online networks to get her out there – virtually – and a little PR bump to boot, Anne now has a fully functioning ecommerce website. Cool! If you live in Bend, be sure to check out The Bulletin next week for more details on Anne. She’s super talented for sure. Who is Scott Bedbury? More than some dude. Much talked about – post the dot gone days – and still today, you can say he single handed-ly shifted the creative industry toward a ‘brand-centric’ state. You would have been hard pressed to come across any design/marketing/advertising/pr/strategy/online firm in the mid 2000’s that didn’t tout their ‘Brand Building’ processes. The brand was (and still is – kind of) King. Advertising had it’s time in the late 90’s with mega agencies like Arnold producing incredible work, and in the early 90’s, it was design that took the stage with super stars like Duffy. Today, The Brand still holds it’s own. For sure, great work will always be done in all creative disciplines, but it was Mr Bedbury (among a handful of others) who brought ‘The Brand’ to the forefront and he’ll be here in Bend to talk to us. Cool. Check out his book. So it’s going to be an Ad Fed gig. I’m a member of Ad Fed and was asked to help develop the creative for this event – It had been a while since I offered my time to the Ad Fed – so guilt set in when I got numerous calls and emails, so I committed – and knowing Scott Bedbury was going to speak made it a pretty easy decision to boot. 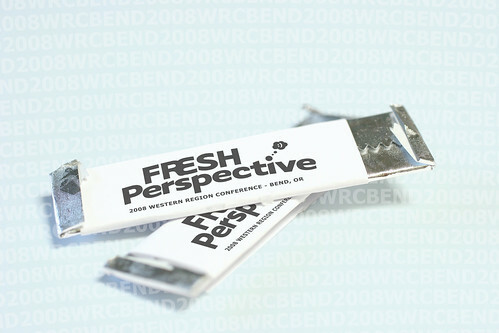 The board already had a concept for the conference – ‘A Fresh Perspective’. Everything else was up to me. The catch? It was due yesterday – kind of. I had about a week to start and finish. 2 days later I was done (At the School of Visual Arts we had 2 hour, 2 day, and 2 week projects – all of which counted equally towards our final grade – I was prepared). On the second day, after they had already approved one of my concepts, I thought of another one as I was walking to the studio. I thumped it up and knew I could make it happen before days end – so I started in a new direction. 1 idea, 2 sketches, 3 packs of gum, and mini photo shoot later, I had everything I needed to make the concept come to life (there may have been a micro brew or two involved as well). 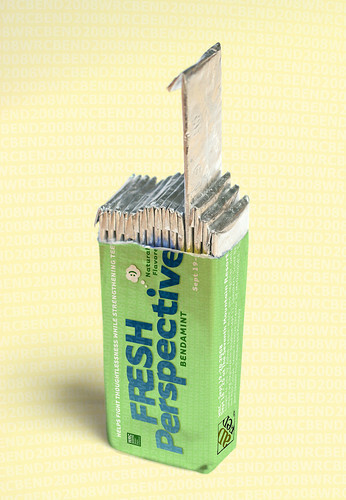 With the help of my trusty Adobe tools – I created gum, and not just any gum, Fresh Perspective gum! Bendamint no less.These photo-illustrations will be the main visual element for the forthcoming ads which will have the conference details. Look for the print ads in the Cascade Business News and The Bulletin.